The first written trace of the village dated back to 1349. The village was owned by many local feudal lords. In 1567 the family of Tvorkovský from Kravaře became the owner of the village. Since 1580 serfs disputed much with them about acknowledgement of manorial labour privileges. In 1699 all previous privileges granted to the serfs were cancelled. In 1621 the village was confiscated and passed over to Order of German Knights. In 1863 the village became possession of the King of Prussia. 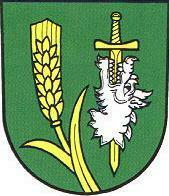 In 1920 the cadastre of the village was incorporated into the Czechoslovak Republic. In 1975 the village was included under the common municipality with the village of Sudice. In 1991 the village re-gained independence. According to description it is a head of the *dragon*. image from Ralf Hartemink's website.